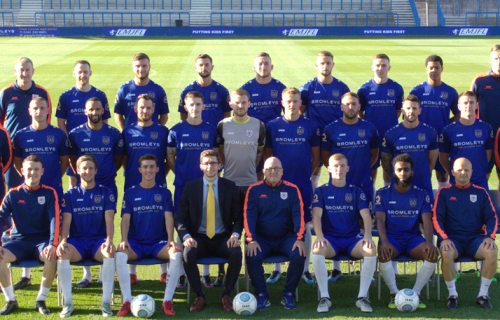 Bromleys Solicitors has renewed and increased its sponsorship of Curzon Ashton FC for the 2018/19 season. The Tameside law firm last season became the official home shirt sponsor of the Vanarama National League North side. This agreement remains in force for the new campaign and Bromleys is also among the sponsors now backing the club’s new 3G training pitch, which is used by the first team and for a host of community initiatives. Curzon Ashton’s home ground is the 4,000-capacity Tameside Stadium in Ashton-under-Lyne. The club runs more than 40 teams in total, from age five upwards. They include ones for girls and women, service veterans and mental health service users. Bromleys partner Paul Westwell said: “We are pleased to renew and enhance our sponsorship agreement with Curzon Ashton for the forthcoming season. “Our firm has a long-standing record of supporting local organisations and we admire the great work which Curzon Ashton is doing in the community. Andy Cheshire, Curzon Ashton’s community development and partnerships manager, said: “We are extremely grateful for the continued support from Bromleys. Ignore Third Party Rights at your peril ! !